Absolut wunderschönes Kit und wirklich gut zu bauen. Die Passform ist auch vollkommen okay und es hat unglaublichen Spaß gemacht, ihn zu bauen und zu bemalen. Ich liebe ihn! 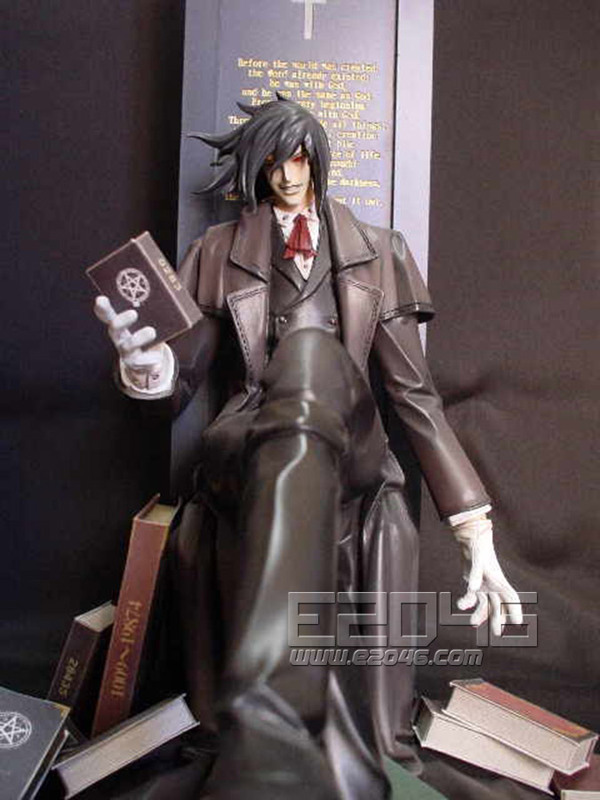 One of the best versions of Alucard! Very atmospheric kit! Nice one, can´t wait to build him! 레진품질이 좋아서 손쉽게 작업이 가능합니다. 동봉되어있는 책 의 출력물들도 품질이 좋습니다. Got him fast, the details are great, the packaging took the brunt of the postal services abuse. came fast ,all the pieces didn't need any fixing and they fit perfectly with each other, my only gripe is that the books are made of paper not resin with decals and that the head looks a little small compared to the body other than that its great. Great design, great figure, fast delivery as usual. Cool figure! Very much I wait when will arrive! Excellent figure! And rather cheap. Loved the series and love the figure as well. Details are crisp and figure is well molded with very few flash. I particularly like the writings on the chair, it is very clear and readable. Very nice cast. The letters on the chair is very clear, I was afraid it would be blurry from the casting process. I like the books a lot too! Great packaging as always. Thank you! 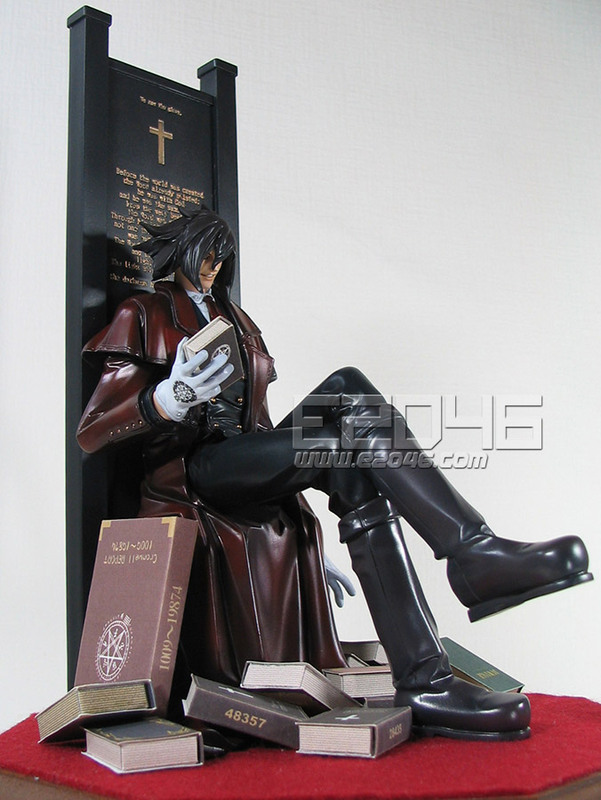 This Alucard surrounding with books `s kit is very wellll, perfect. Including the books is a nice touch! Very clean kit, I love the new packaging style. 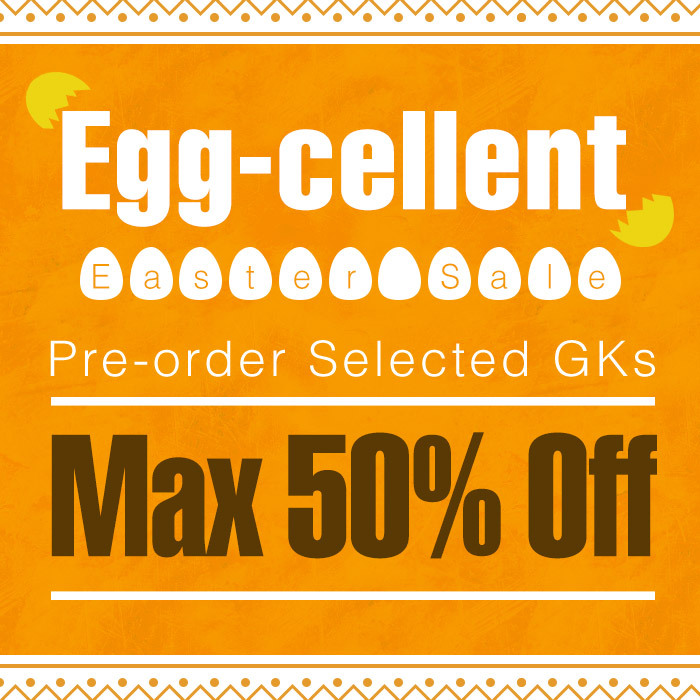 Excellent GK. I won't wait when it I will paint. 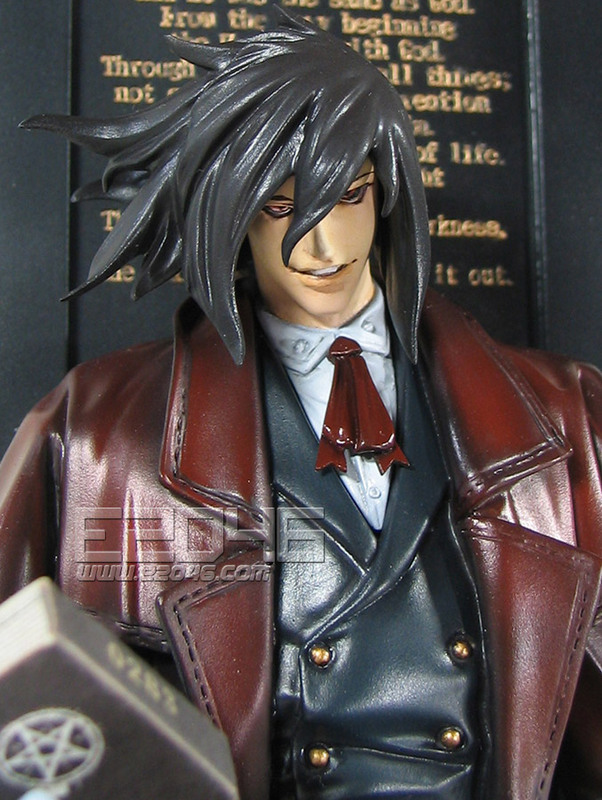 ALUCARD has a good dry fit, I've got some ideas with customising his base though, looking forward to it! 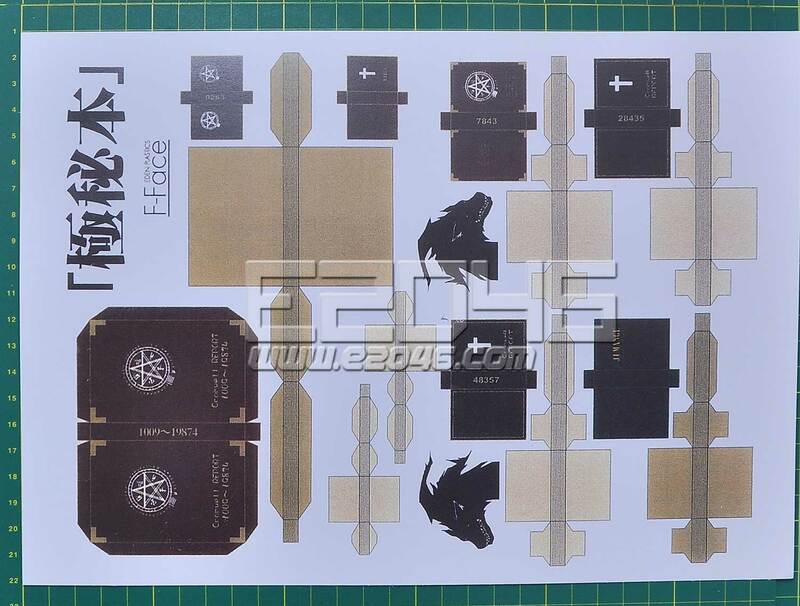 Great looking kit which I believe will be a joy to build. 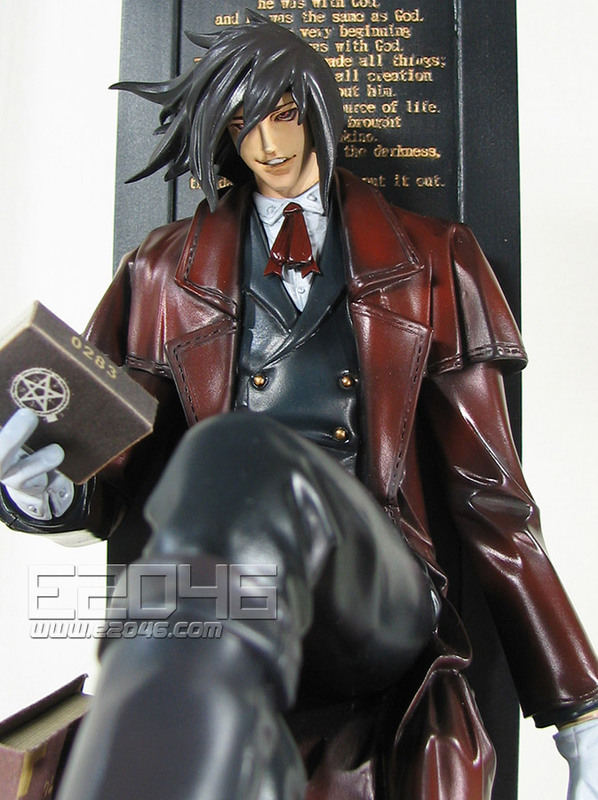 The parts fit together well and I do recommend to get this one if you like Hellsing. The casting seems good on most parts except the back panel of the chair. The thickness of the centre portion with the text varies quite a bit and is paper thin in some spots so may break easily. The detail is spot on as normal with E2046 kits and the parts dry fit quite well together. One issue I do have is that the books that are included are printed on regular paper and have a very low colour saturation and dpi. I will probably end up vectorizing a scan of the books in Adobe Illustrator and reprint it on quality paper with a higher dpi. Other than the issue with the books there isn't much else wrong with this kit. 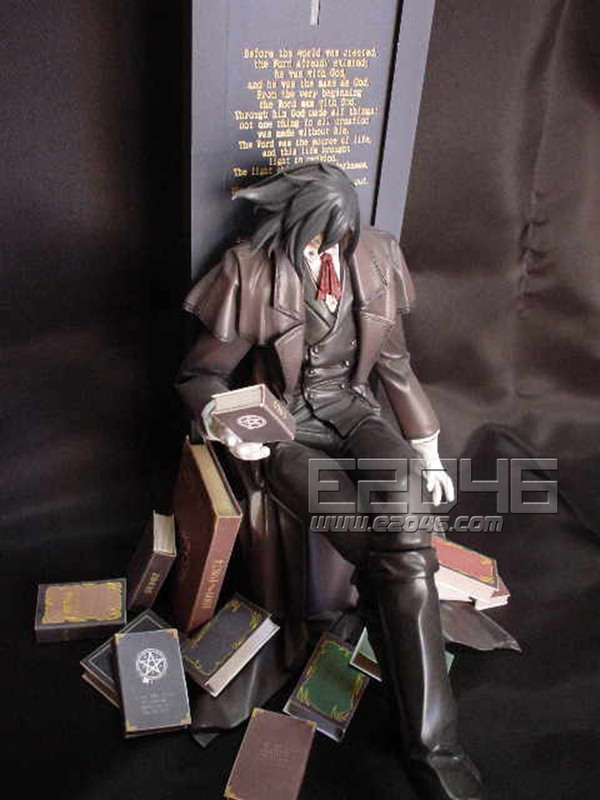 Alucard Surrounded with Books has arrived safely with all parts present and correct. The cast is well defined with no seams and very little flash. The only problem with this kit is that the photocopy of the books is very faded and indistinct. Thanks for a nice kit E, but a better quality photocopy of the books needs to be sorted. I just received my Alucard today. Great job, amasing details. 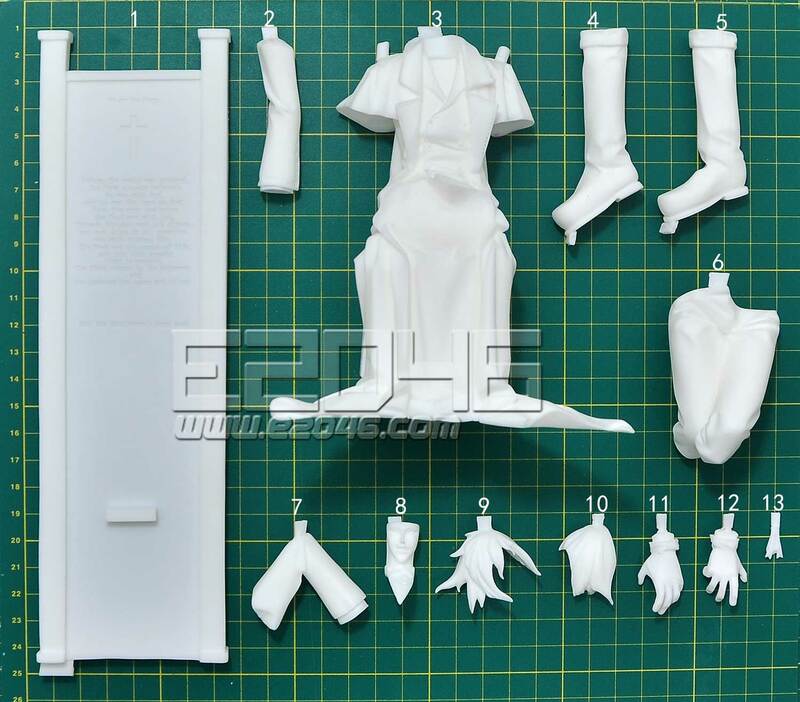 Hi, I am really pleased to have received Alucard, this model is really impressive, full details .... large, and very good quality. Just the books that are printed on plain paper and are a bit vague (if someone has high resolution versions ). So thank you again e2046 you deserve your reputation ! Cant. This Kit is perfect! perfect joints and resin like always of high level, the books in cartoncino are plasticized, but they are not necessary. Alucard has one rests alarming and serene, at the same time magnificent Thanks e2046 for this wonderful piece! Another one of those kits I've pined over for a long time, and I finally own it! 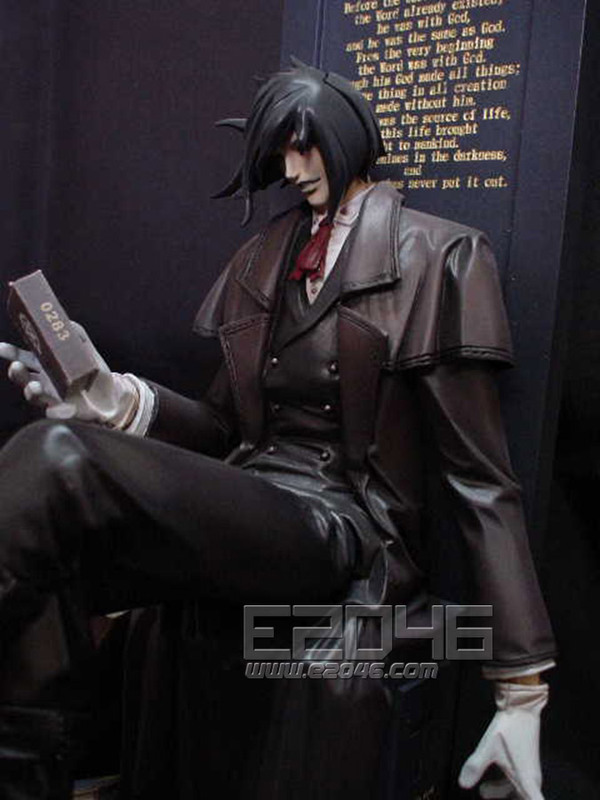 Again I was surprised at the detail in the sculpt, even the trim of his jacket is accentuated, and the books were a good addition. 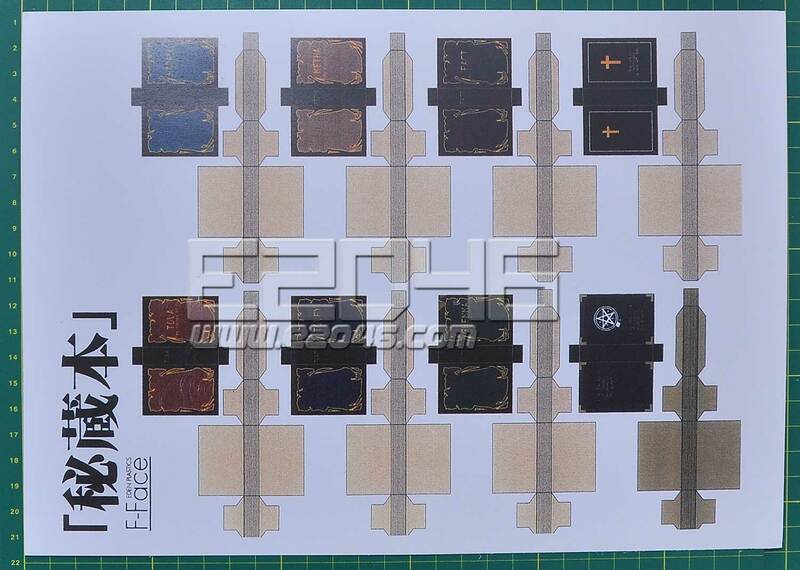 I think they were intended to be printed on plastic or a thicker card stock though, E2046 only provides you with what looks like regular inkjet printer paper with the books on it. Nothing that isn't workable, but as the books are designed papercraft style they really should be on card stock. The casting was again superb, there is a little extra flash in the jacket but it's easily removed and seems to be there to help the stability of the jacket collar, which has some very delicate edges. 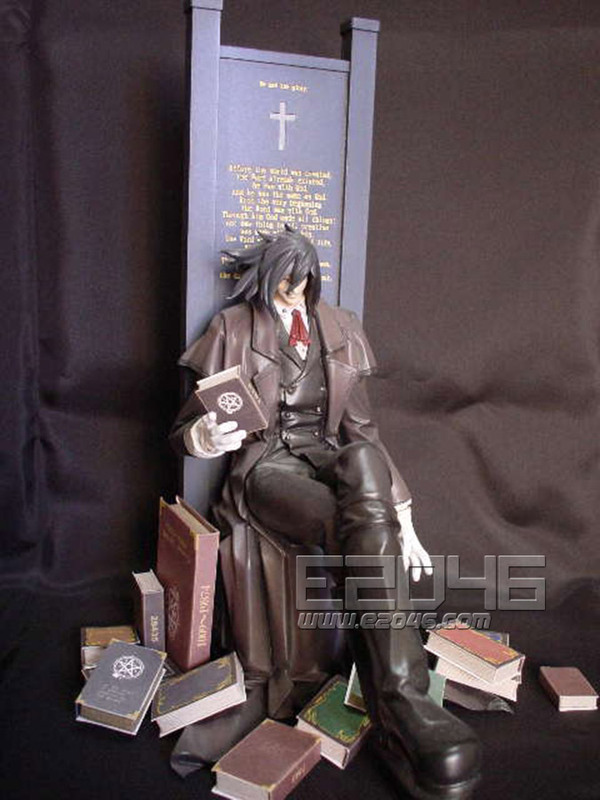 I wish his jacket were casted separately from the bottom of the chair, this will make painting a little difficult, but nothing too bad. Just a few things for potential buyers to take note of. Overall a very lovely kit, and I'm happy I bought it finally! The model kid has arrived me in good condition and it is wonderful. Both figures took a long time to arrive because of pre-order, but once they shipped, they arrived in just a few days. All resin parts are counted for and nothing was broken. I noticed a few pinholes but they can be easily fixed. One problem with the Alucard kit. 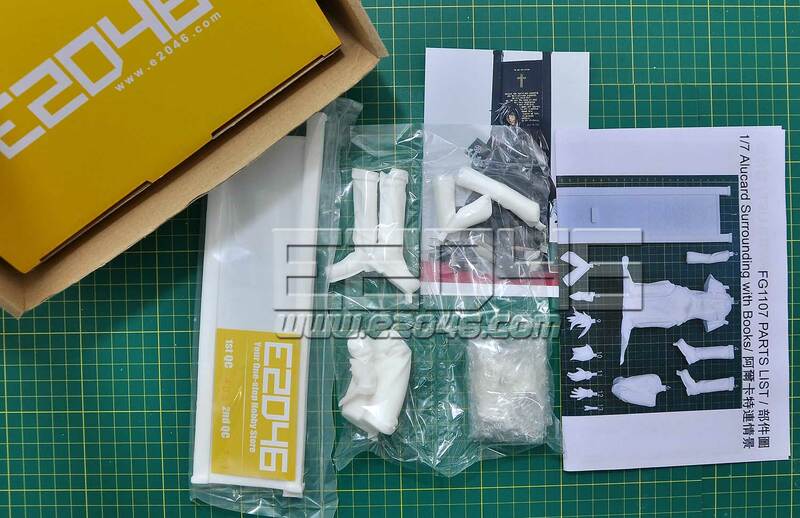 I read other comments on this kit and many buyers said the kit came with paper books like in the picture. My kit came with no books at all. Were the books just a temporary special or something? Other than that, the kits are great. Thanks E2046! after months long of waiting, arucard has awakened. 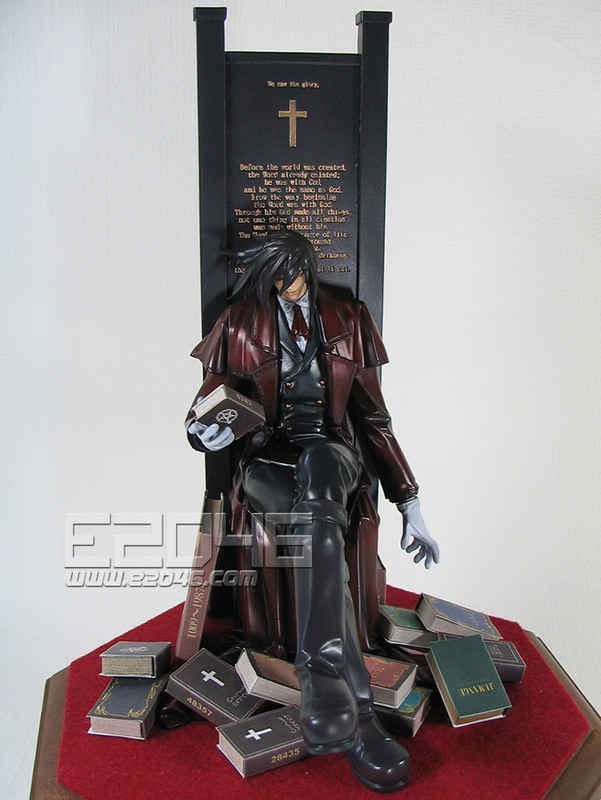 he is now resting in my cabinet, waiting for the second awakening by me. 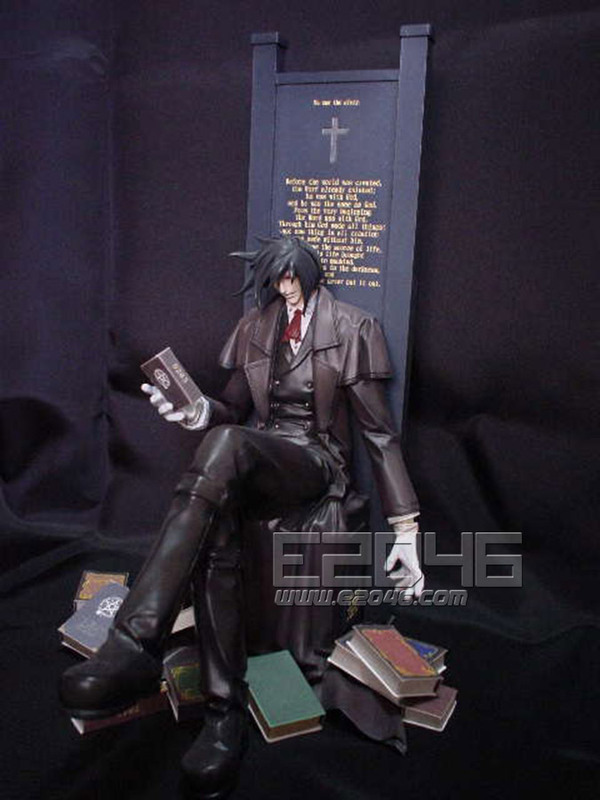 for this figure, i like the posture very much, very stylish. however, the 'paper' books will spoilt his entire image. maybe e2046 can cast the books out and this will make him more perfect.